Jo Nesbo is one of those authors who I'm familiar with, but wish I would read more of. I can't begin to tell you how many of my book blogging buddies have read and enjoyed Nesbo's novels. Beyond reading The Redbreast long before I started my blog and recently tackling a Shakespeare retelling in Macbeth, I've never read through any of his other books. During a backpacking trip through Europe last year I bought a couple copies of Nesbo's books in Sweden. And so finally, after years of hearing great things about his books, I've picked up The Snowman. Harry Hole is the hero of this series. As an investigator for the Oslo Police, Hole has an infamous reputation for finding serial killers. Recently, his life has taken a dark turn. His long time partner has left him and has started seeing another man. The end of this relationship has also strained his relationship with her son. Harry has turned to alcohol to soothe his pain, a habit that is increasingly inhibiting his ability to do his job. Worst of all, his colleagues at the police department are beginning to question his role within their unit. A make or break moment arrives in the form of the disappearance of a local woman. Her young son is left at home alone. Even more strange, someone has built a snowman adorned in the missing mother's scarf. Harry and his new partner are assigned to the case. As the pair dig into the circumstances surrounding the woman's disappearance, the uncover a pattern of similar missing women throughout the years. When Harry receives the taunting letter from the person behind the vanishing women, there is no denying that a serial killer has emerged. Harry will have to overcome his own personal demons to find and stop this mysterious snowman from striking again. Nesbo's series has seen a rather unconventional publication in the US. Translated into english, the novels have been released out of chronological order. As such, I don't think it is required that you read the series in order. The Snowman is the seventh in the series, and Nesbo does an adequate job of filling in the gaps of the past so that I never felt lost while reading it. Everything about this novel, from the characters to the disturbing details of the crimes, is dark. Nesbo compliments this darkness with a brisk and transactional prose. Harry Hole is a far cry from the usual heroes in detective fiction, but he is endearing in spite of his grim demeanor. 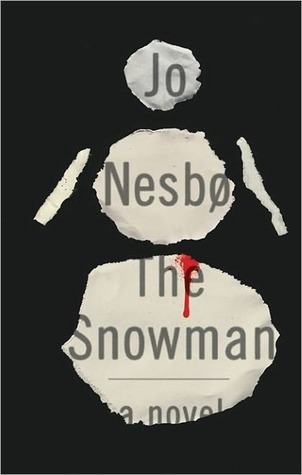 With an ever present suspense, shocking twists and revelations, and an extremely satisfying ending, I can see why many readers have called The Snowman one of Nesbo's best. "I will not tell you how it happened but it is all wrong." Years ago, I discovered Michael Koryta through his supernatural driven thriller So Cold the River. I instantly devoured his other paranormal suspense novels including The Cypress House and The Ridge. I was especially impressed with the way Koryta allowed his character's development to drive his narratives, even when they were filled with suspense that could have easily dominated the story. 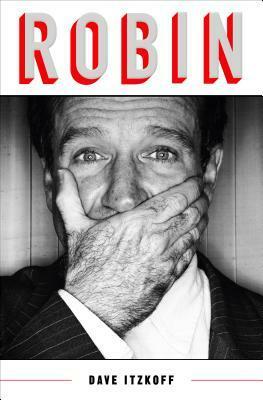 When I got the chance to read and review his latest effort How It Happened, I enthusiastically accepted. Rob Barrett is an expert and finding the truth. As an FBI investigator, he is well known for extracting confessions from hard-to-crack suspects. He's recently returned to the rural seaside community that he was raised in to help find the truth behind the brutal murders of two young residents. Barrett's past includes lingering questions about his mother's untimely death years ago, the harsh upbringing by his verbally and emotionally abusive grandfather, and an unwavering commitment to discovering the truth. Kimberly Crepeaux is not known for her honesty. With a rap sheet of teenage pregnancy, heroin addiction, and numerous stints in prison, her reputation around town couldn't be worse. It comes as no surprise to anyone who knows her when she is arrested again, but what she has to say this time stops everyone in their tracks. Kimberly tells the story of her involvement in the gruesome murders of the two young townspeople. A night of drug fueled joy riding turned dark when their car stuck a girl. Terrified of the consequences of their actions, the group brutally killed the car-stuck girl and her boyfriend and dumped their bodies in a nearby pond. Despite her troubled reputation, Barrett believes Kimberly when she describes that night. She speaks with a sincerity or regret and shock at her actions. There is a haunted glimmer of anguish behind her tired eyes. Barrett is quick to accept the confession as fact and hinge the investigation and his entire career upon it. This is the break the case needed. This is the source of closure to two grieving families. This is how it happened. But suddenly it isn't. The pond is searched and the bodies are not there. An anonymous tip quickly leads to the discovery of the bodies some 200 miles away. Desperate to save his professional reputation and ease the disappointment of his home town, Barrett rallies to find the truth of how it happened. On first glance, How It Happened is vastly different from the previous novels by Koryta. Gone are the supernatural elements that permeated those earlier works. Instead the characters in this novel are haunted by events that are all too real. I was immediately intrigued by the gruesome confession that Kimberly provides. The novel opens with her words, providing a chilling prelude to the dark and suspenseful events that follow. By setting the novel in Barrett's home town, Koryta allows the character to gain layers of depth from interactions with people from his past and flashbacks to his childhood. The novel deftly layers the mystery with contemplations on grief, addiction, reputation, and small town relationships. 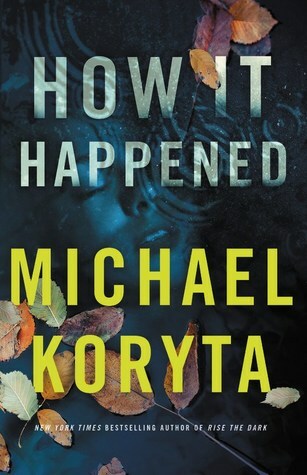 How It Happened is destined to be a must-read this summer, and serves as a legacy cementing achievement in Koryta's already stellar career. I recently read a news article about the top bestselling books of this year. It turns out that the majority of these books have one thing in common, Donald Trump. Love him or hate him, you can't deny that the American President dominates the news like none before him. We can't seem to get enough of him. 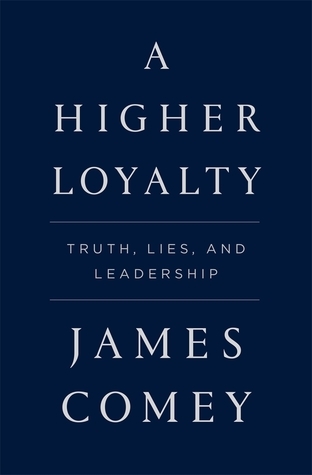 In A Higher Loyalty, one of the most anticipated books of the year, fired FBI Director James Comey reflects upon his years of public service and his encounters with President Trump that would ultimately end his career. Beyond the scandal and outrage surrounding his role in the investigation of Hillary Clinton's emails and his unexpected firing, I really wasn't familiar with James Comey. Throughout the book, Comey builds a portrait of his commitment to the higher institutions of government. His early days as a lawyer saw him soon working under the New York Department of Justice. His encounters during this time served as a foundation for his views that no one is above the law. When the New York DOJ learned of Martha Stewart's insider trading, Comey was quick to push for a criminal trial. As the Deputy Attorney General under President George W. Bush, Comey continued to campaign for truth and justice. Specifically, when he learned of the questionable interrogation tactics that would later be classified as torture, Comey went against the wishes of the administration to fight for better practices under the law. He would ultimately be proved to have been on the right side of history in this instance. The highest profile and most controversial era of Comey's public service came during his tenure as FBI Director. He was surprised that the Democratic President Obama would hire someone who served a Republican administration, but Comey was hired for his independence from politics, not his loyalty to a specific party. The unprecedented nature of the 2016 election saw Comey face the largest challenges of his professional life. The investigation into Hillary Clinton's use of a private email server to conduct official state business was one of the biggest talking points of that race. When Comey announced that the investigation was being reopened just a few days before the vote, he did so because he believed the American people needed to know. He describes institutions like the Justice Department and FBI as holding a "reservoir of trust". By being open about the ongoing investigation, he hoped to maintain that trust. There's no doubt the main draw of this book is to read Comey's perspective on his interactions with the President and his firing. Most of what is written about these moments has already been made public through Comey's statements to congress. In comparison to his interactions with the previous two administrations, Trump's attempts to pull in the FBI Director to his inner circle at the White House are very alarming. If what Comey claims is true, it seems clear that the current administration did not see a need to separate the FBI from the politics of the presidency. History will ultimately judge this situation and show if Comey's firing was truly an obstruction of justice. Having read about his life in his own words, I'm still not entirely sure what that judgement will be. There is no denying that Comey is a fascinating, if a bit problematic, figure who deserves to be heard and recognized. Idlewild Hall in Vermont is a boarding school for troubled girls. It is a dreary place that has become home to the kind of girls nobody else wants to deal with. This type of establishment is commonplace in the 1950's. An odd cross between school and psychological asylum, Idlewild has become a dumping ground for the girls who won't end up getting the kind of help they truly need. Amongst the halls of this sad place, a group of students ban together for support and refuge. But their sanctuary is threatened. It is threatened by the internal turmoil that lies just beneath the surface of each girl. It is threatened by the strict rules and discipline of the staff of the school. And perhaps most frighteningly so, it is threatened by the ghost of Mary Hand. The year is 2014 and reporter Fiona Sheridan is about to stumble upon the biggest story of her career. the long vacated and dilapidated Idlewild Hall has just been purchased by a private buyer who intends to renovate and reopen the school. All viable businessmen agree that restoring the Idlewild property is a losing venture, but the owner is adamant that the school function again. Fiona is determined to dig deeper into the mysterious owner. Through alternating chapters, Simone St. James tells the story of the girls who inhabited Idlewild and Fiona's investigation into the school's reopening. We quickly discover that there is more to the halls of the institution than meets the eye. The students tell the story of Mary Hand, a local girl who was said to have died on the property long before the school was built. We also learn that Fiona's sister was killed and left on the grounds of the abandoned property. A scorned boyfriend has been in jail for the murder, but Fiona has always posited that something more was afoot. Could the local legends of a ghost on the property have something to do with her sister's death? 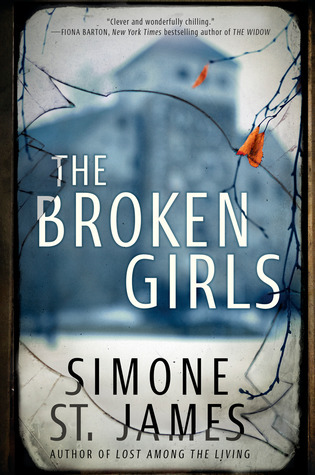 The Broken Girls hits all the right notes for a solid thriller. The combination of a decades old murder case and ghost story instantly drew me in and left me riveted through the final page. I'm not usually a fan of the overused tactic of alternating time periods from chapter to chapter, but St. James deftly uses the technique to slowly reveal her story and creates an ever building sense of suspense and dread. St. James expertly takes the "less is more" approach to conjuring the horror elements of her story by only giving short glimpses and subtle hints to Mary Hand's presence in both past and present portions of the story. The terror that my imagination summoned from this lack of information about the ghost was far more frightening than anything that could have been described. The best fiction is built not upon the premise of the plot, but on the characters who inhabit it. St. James weaves a deep thread connecting the past and present characters in a way that is both believable and satisfying to her narrative. Through the students at Idlewild, we see how a system abandoned the people who were in dire need of help. Whether facing the trauma of domestic life or the horrors of war, the girls were ultimately left to fend for themselves and made more susceptible to the fancies of a supernatural entity. In the present day, Fiona's dealing with grief and small town politics highlight the struggle of a woman in a male dominated field. Add in the spooky atmosphere of the small Vermont town, and St. James has a real winner here. It is still pretty early in the year, but I'm almost certain The Broken Girls will end up being one of my favorites.